Fill in your details below and we will let you know within 24 hours if we can get Puerto Rico: Expansions 1 & 2 to you with haste! 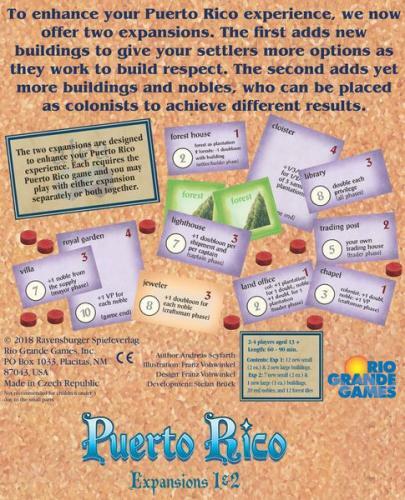 For the first time in 10 years, the expansions for Puerto Rico, the hugely popular, award-winning game, will be available again in one set. The first expansion adds new buildings to give settlers more options as they work to build respect. The second ads yet more buildings as well as nobles, who can be placed as colonists to achieve different results. Expansion 1, The New Buildings, adds 12 small, and 2 large violet buildings, as well as 12 forest tiles. Expansion 2, The Nobles, adds 6 new small buildings, 1 new large building, and 20 red nobles.